It is now widely recognised that countries around the world are becoming increasingly interconnected, and that both public and private organizations are of necessity becoming increasingly global. As political, legal, and economic barriers recede in this new environment, cultural barriers emerge as a principal challenge to organizational survival and success. It is not yet clear whether these new global realities will cause cultures to converge, harmonize, and seek common ground or to retrench, resist, and accentuate their differences. In either case, it is of paramount importance for both managers and organizational scholars to understand the cultural crosscurrents underlying these changes. 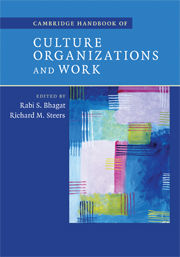 With contributions from an international team of scholars, the Cambridge Handbook of Culture, Organizations, and Work reviews, analyzes, and integrates available theory and research to give the best information possible concerning the role of culture and cultural differences in organizational dynamics. RABI S. BHAGAT is Professor of Organizational Behavior and International Management at the Fogelman College of Business at the University of Memphis. He is a fellow of SIOP, APA, APS, and the International Academy for Intercultural Research. He has edited handbooks in the area of cross-cultural training and has published widely in the area of cross-cultural organizational behavior and international management. RICHARD M. STEERS is Professor Emeritus of Organization and Management in the Lundquist College of Business, University of Oregon. He is a past president and fellow of the Academy of Management, as well as a fellow of the American Psychological Society and the Society of Industrial and Organizational Psychology. Professor Steers has published widely in the areas of work motivation and cross-cultural influences on management. 3. When does culture matter?